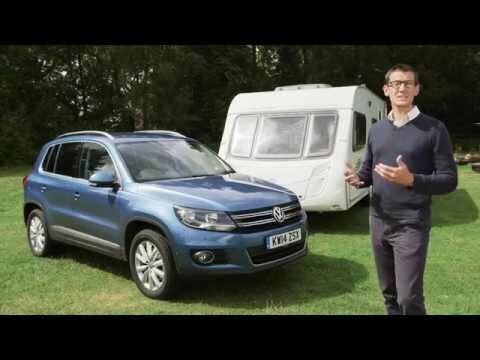 Practical Caravan's tow car expert David Motton puts the Volkswagen Tiguan through its paces – please like, comment and share! The Volkswagen Tiguan has been around for some time, but the 177PS diesel engine is new. Along with more top-end power than before, it has 280lb ft of mid-range torque; that should be more than enough to comfortably pull any suitably matched caravan. The engine promises good economy as well as strong performance, with an official combined economy figure of 50.4mpg. Read on to find out what tow car ability the VW Tiguan has and if it could be the ideal companion for your caravan holidays. Stable towing is a must, and we know from past experience that’s what we should expect from the Tiguan. We also want to see whether the engine lives up to its promise. Many rival SUVs are roomier but cost a similar price, so is the Tiguan practical enough? The VW Tiguan feels at home when towing. It’s stable, quick and composed with a caravan. With a kerbweight of 1688kg, the Tiguan has an 85% match figure of 1435kg. That means a wide range of mid-sized tourers make sensible matches, even for drivers who are new to towing. The legal towing limit is 2200kg, and the maximum noseweight is a healthy 100kg. We matched the Volkswagen to a Swift Challenger 530 with a mass in running order (MiRO) of 1345kg and went towing on the road and at the test track. At motorway speeds, the Tiguan gets on with the job quietly and efficiently. It’s untroubled by crosswinds and holds a straight and steady course, rarely needing much input from the driver. In an emergency lane-change, the VW Tiguan takes firm charge of the caravan. There’s some lean when changing direction as you might expect from a 4x4 but, even when swerving violently, the car’s movements are controlled. Precise steering helps the driver place the car neatly and, even when the tourer is sliding around behind it, the back of the car maintains a firm grip on the road. Stability is matched to strong performance. With 280lb ft of torque, the 2.0 TDI engine copes easily with a mid-size tourer such as the Challenger 530. With the Direct Shift Gearbox (DSG) in ‘sport’ mode, car and caravan accelerated from 30-60mph in 10.9 seconds. Pulling from 50-60mph, as you might from behind slow motorway traffic, took 5.3 seconds. On hilly roads it’s easy to maintain speed, especially in sport mode, which encourages the gearbox to change down more readily. However, in either sport or normal mode, the ’box sometimes held on to a low gear for longer than necessary. Unless you have to stop and start on an extreme gradient, hill starts don’t pose much of a challenge. We found that the electronic handbrake held the car and caravan still on a 1-in-10 slope and released smoothly when we pulled away. In fact, with the hill-hold function switched on, there’s no need to apply the brake to stop the car from rolling backwards. With no clutch to balance, thanks to the DSG transmission, the Volkswagen Tiguan confidently pulled to the top of the hill and managed the same gradient in reverse. Of course, its torque and four-wheel drive also played a part. In regular towing, the brakes were easy to apply smoothly and felt powerful when required. On a dry test track the car needed 11.6m to stop from 30mph. That’s a reasonable distance, but we’ve tested a number of cars that have needed less road to come to a halt. So, with a couple of minor provisos, the Tiguan tows very well indeed. Stability at speed is reassuring, and the powerful 2.0-litre diesel engine offers a worthwhile step-up in performance compared to the 140PS engine. If you want a car for towing a mid-sized caravan in all weathers, the VW Tiguan fits the bill. Without a tourer, you really notice the engine’s muscle. In solo driving, most drivers would be happy enough with the 140PS version of the VW Tiguan, but there’s no doubt that the 177PS has plenty of extra punch for overtaking. The DSG transmission changes gear smoothly and usually chooses the right gear, although drivers can take charge of gear selection themselves if they prefer. You couldn’t say the engine is whisper-quiet when worked hard, but once up to speed it settles into the background. There’s a little wind and road noise to contend with but, for the most part, the Volkswagen is refined. It’s comfortable, too, with a well-judged suspension set-up that combines comfort and control. Like a Ford Kuga, the Tiguan does a good job of keeping both its driver and passengers happy. There are plenty of bigger 4x4s than the Tiguan for similar money, but the VW’s size has its advantages. It feels compact and wieldy around town, and will fit into smaller parking spaces than the likes of the Hyundai Santa Fe and Kia Sorento. Head out of town on to country roads and the Tiguan feels more agile than many of its bigger rivals, more like a well-sorted hatchback on stilts than a roly-poly SUV. As a solo drive, the Tiguan is very accomplished and more fun than many rivals. It’s a car we’d be very happy to live with day-in, day-out. In one form or another the Tiguan has been around since 2008. It may not feel its age when driven but, inside, time is catching up with the cabin. Functionally, there’s not a lot wrong with the Volkswagen’s dashboard, but its look is old hat compared with newer rivals. Everything is well screwed together, but it’s bland and lacks the upmarket feel of newer VW cabins, such as the Golf’s. Up front, there’s plenty of space and the driving position is comfortable. There are some practical touches, too; for example, the tray on top of the dash which should prove useful for keeping your travel documents close to hand when on your caravan holidays. Those in the back don’t have quite so much space as those in the front seats. Legroom is on a par with that in the Golf or other small hatchbacks. Many rivals, such as the Honda CR-V, offer a lot more space for those travelling in the rear. That said, it’s good to see air vents between the two front seats to blow chilled air at those travelling in the back, and although the transmission tunnel does steal some foot room, it’s not especially intrusive by 4x4 standards. Boot space is another area in which the Tiguan seems no better than it should be. There’s 470 litres for bags, compared with 589 litres in a Honda CR-V. Boot space can be extended by pushing the rear seats forward on runners, but this eats into the already limited legroom. Folding down the seats to make more luggage room is an easy job since there’s no need to move the seat bases first, but it does leave a slope to the load floor. The Tiguan won’t suit anyone looking for a third row of seats, something that rivals from Hyundai, Kia and Nissan now offer as standard or as an option. In isolation the Tiguan is a reasonably practical car, but it falls short of the space and flexibility offered by some rivals. With a list price of £29,450, this particular Tiguan isn’t cheap, although it’s worth noting that you’ll knock £1525 from the asking price if you choose a six-speed manual gearbox instead of the seven-speed DSG. It’s well worth haggling with the salesman, because What Car?’s Target Price researchers believe £26,363 is a realistic transaction price, a discount of around £3000. The VW should hold its value well despite being a relatively old design. What Car? predicts that it will still be worth 56% of the original price after three years and 36,000 miles. Running costs should be reasonable, too. The official combined figure is 50.4mpg, and we found the VW Tiguan returned a respectable 26.7mpg when towing. As for insurance, the car sits in group 23E. Like all VW passenger cars, the Tiguan comes with a three-year, 60,000-mile warranty. If you’d prefer longer cover, a Hyundai comes with a five-year warranty package and Kia’s warranty lasts for seven. Nonetheless, thanks to sizeable discounts, strong resale values and good fuel economy, the VW is a sensible buy. Here and there, the Tiguan is starting to feel its age – most notably in the cabin – but as a tow car, the Volkswagen still performs. The power of the latest TDI is combined with good stability at speed, to make the VW Tiguan an easy and relaxing car for towing. With a caravan behind it, this tow car does its job without fuss. We had no nervous moments when towing, even when driving aggressively at the test track. It’s fundamentally a very well-sorted SUV that takes the demands of towing in its stride. The 177PS engine is very punchy. The 140PS is strong enough to tow with, and many drivers will prefer to save their money. But for a premium of £1005, we think the more powerful car is worth the extra if you tow regularly, especially if you own a heavy caravan. In solo driving, the Tiguan is every bit as capable and easy to live with. As happy on long motorway journeys as it is on the school run, the VW will turn its hand to anything and do it well. It’s even good fun on B-roads – something you can’t say of every family SUV. However, there’s no doubt you can buy roomier and more practical cars for the money. The Hyundai Santa Fe or Kia Sorento have more power and higher kerbweights, while a Honda CR-V has more space for passengers and their bags. If that doesn’t put you off, though, the VW Tiguan still has a lot to offer.